What’s more American than baseball and apple pie? It’s the Ford F-150 pickup. For more than a half-century, this truck offered one of the most reliable and safe modes of transportation for Americans. And for the 2019 model year, Ford is looking to keep that image intact with some of the market’s finest safety features. 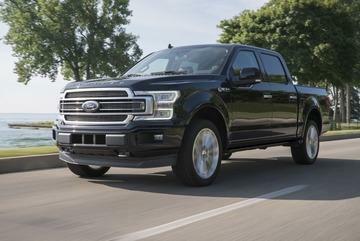 So, let’s take a closer look at how the legendary 2019 Ford F-150 will keep you safe during your drives. For 2019, the Iconic Ford truck sports quite the durable body. To be exact, 78% of its frame is constructed from high strength steel. Other materials here include military-grade alloy to prevent rusting and corrosion. It goes without saying this frame is one of the toughest you’ll find on the market. And as far as performance goes, this body is built with the intention of reducing crushing upon impact. Plus, by making use of a 12-sided design, the Ford F-150 offers incredible front-impact protection. Also, to enhance you’re safety in any impact, you can opt for a SuperCrew model for inflatable rear seat belts. You can’t argue with extra protection. What’s great about the all-new 2019 Ford F-150 is the available Trailer Backup Assist. This feature really makes life easy when you’re driving with a trailer attached to your Ford truck. For starters, this feature automatically steers the truck for you in whichever direction you need to go without swaying your trailer. To make matters better, the cameras around your truck help you see all of your surroundings—which is great when you’re driving your Ford F-150 through crowded streets and locations. To also help, you’ll get a Smart Trailer Tow Connector. This feature makes driving with a trailer even safer by providing alerts anytime one of your lights goes out. Lastly, if you’re looking to keep your drives easy and safe, then look no further than these driver assist features. 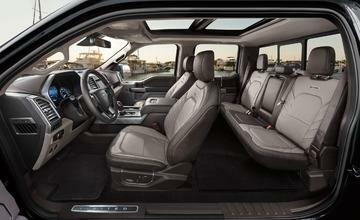 Here’s some of what you can expect in the new Ford F-150. This feature automatically keeps up with the flow of traffic without you needing to push the gas pedal. Instead, the truck measures the distance between other cars ahead and slows down accordingly—even in stop-and-go traffic. It’s all in the name here. Stay in your lane with ease with this feature. Anytime you start to enter other lanes on the road, you’ll receive a prompt to steer you back into your own lane. This feature even comes with a driver alert system to recommend when you should take a break from driving if you seem to be dozing off behind the wheel. This feature keeps track of other vehicles’, pedestrians’, and objects’ distances relative to your truck. And if you come to close to any of the above, active braking will come into play to ensure you and your car remain as safe as possible. Are you wanting to get behind the wheel of one of the market’s safest trucks? Then come to your local Southern California Ford Dealers to test drive one of these trucks today. And while you’re at it, be sure to give some of these driver assist features a try for yourself. If you like what you see, ask about how to drive one home today as well.